Roaming Stamper: Future Demo at Work? 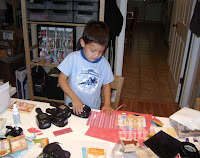 I've mentioned how my grandson loves to come and work in my stamp studio. So, I thought I'd share some photos from the last time he was here. He really loves to do wheels but recently discovered my punches. Probably because they now hang on the wall where he can see them. Before they were in drawers and he didn't know they were there. Anyway, he loves to find my " pretty paper" and punch out shapes but the teacher in me makes him glue his shapes on paper when he's done. Othewise I end up with a bunch of punched shapes laying around. 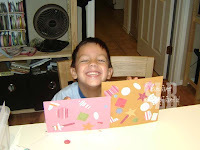 He's always so proud when he gets done but doesn't care for the gluing part as you'll see in one of the pictures. 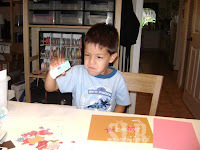 He doesn't like it when the glue gets on him or when it sticks to his punch and he can't get it off. It's really quite funny to me, but not to Mr. Serious. What I love most about times like these is how simple they are. 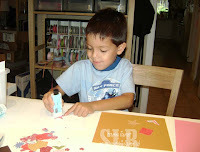 All he needs is some paper, glue, and punches and he can be entertained for quite awhile. In this day and age with all the electronics and fancy toys for kids, I love that something so simple can bring so much joy! He is so cute! That's a great idea to have him glue the shapes on. What a face! Aren't grandkids the best??? And what a great grandma to let him play in your stash!